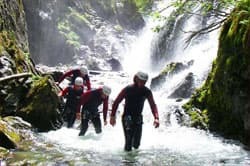 Canyoning adventure in Madeira Island from only €65 pp with Madeira Canyoning Adventures.Join an exciting full or half day canyoning adventure in Madeira Island in the beautiful Laurissilva Forest. Explore hidden gorges,rappel, jump and slide down waterfalls, and discover the thrill of canyoning in Madeira. 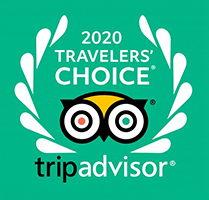 This experience is 100% enjoyment and we keep you safe by providing you with all the necessary safety equipment and you're with an instructor at all times. 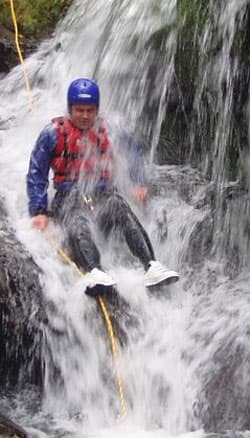 Beacuse we move through fast flowing water and encouter various tricky obstacles, canyoning is only suitable for children over the age of 11. No experience necessary – we train you and provide you with the gear the skills to explore the canyon. Lots of options – full on free-styling jumps or canyoning introduction trips – you choose. We provide transport from Funchal Centre to the canyons – (only 40 minutes drive from Funchal central). 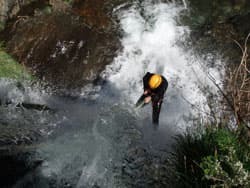 Not only do you get some great canyoning adventure in Madeira, but you will see a the Laurissilva Forest., learn about the local flora /fauna and history of the area. Awesome fun, awesome people and breath-taking scenery! No experience is neccessary just a sense of fun and adventure. The course is short in duration, in total 3 hours. 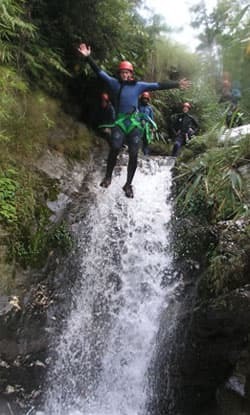 The Canyoning we will do can be located within the south coast . On this river we will cover a distance of 950m and descend about 215m. Throughout its descent, we have: 4 rappels, three jumps (optional) and a toboggan slide. The highest rappel is 18meters. sneakers, a swimsuit and a towel. Includes: transfer, insurance, pictures of the tour, individual equipment, water and chocolate, 2 certificated guides). Throughout its descent, we have: 8 abseilings, various jumps and slides. The highest Abseiling is 50 meters. For this course you will be required to do an1.30 hours uphill climb carrying your own equipment. The course itself is about 4 to 5 hours long with 30 minute Return. 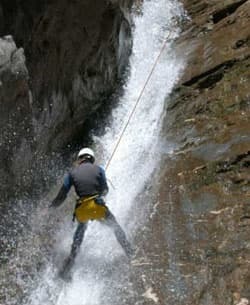 The Canyoning we will do can be located within the North coast .Located in the herat Laurissilva Forest. Throughout its descent, we have: 19 abseilings, various jumps and slides. The highest Abseiling is 60 meters.